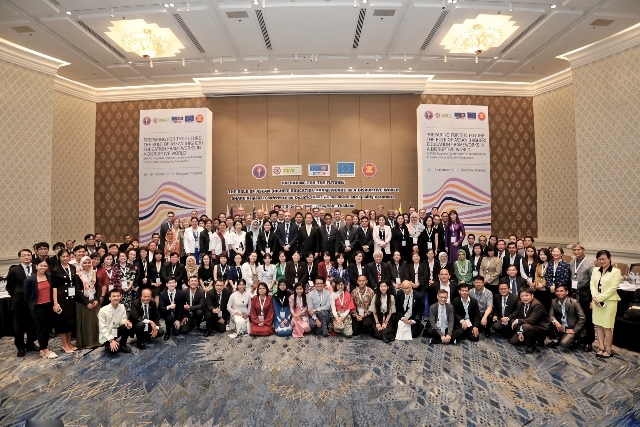 Bangkok, 29 October 2018 – The Association of Southeast Asian Nations (ASEAN), the Office of Higher Education Commission (OHEC), the European Union (EU) to Thailand and the Southeast Asian Ministers of Education Organisation (SEAMEO) Regional Centre for Higher Education and Development (RIHED) jointly hosted the European Union Support to Higher Education in the ASEAN Region (SHARE) Regional Conference on Qualifications Frameworks (QF) and Quality Assurance (QA). "Preparing for the Future: The Role of ASEAN (Higher) Education Rrameworks in a Disruptive World" convened policy makers, university leaders, higher education managers and students to reflect on current developments and challenges in the ASEAN higher education landscape. The role of Qualifications and Quality Assurance Frameworks as useful tools in supporting higher education systems amidst the challenges posed by Industry 4.0 was also discussed. The conference aims at capitalising on SHARE’s project achievements in the fields of QF and QA, particularly in fostering the sustainability of the project outcomes, identifying major topics that will shape the future of higher education in ASEAN. The conference welcomed together 200 participants, among them are higher education policymakers from ministries and universities as well as experts on QF and QA, Students from both Europe and Southeast Asia also attended. The conference is structured in three parts: (1) Taking stock of achievements in SHARE Result Area 2: How do stakeholders perceive the conducted activities? What is the impact of the capacity building that took place? (2) Discussing the current state of the AQRF and AQAF, while connecting the frameworks to the debate on the current challenges ASEAN higher education faces. (3) Planning for the future: Which topics need further attention and how can these be addressed, either within SHARE or other initiatives? The photos of conference are available here. The video of conference is available here. Student Statement is available here. The programme book is available here. Related article on the interview of Marc Wilde and Michael Hörig is available here. The Report on Quality Assurance Arrangements Related to National Qualifications Frameworks in ASEAN and Their Impact on Higher Education is available here.